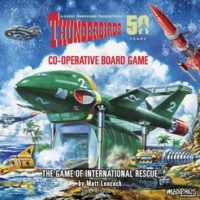 The Thunderbirds game includes cool 6 plastic models of the Thunderbirds machines plus the evil Hood, 6 Character pegs, two special custom Rescue dice, cardboard tokens for the Pod Vehicles for Thunderbird 2 and Bonus Chips for use during the game. In addition to the high quality linen finish board, there are 208 high quality linen finish cards representing the Disasters, the Hood's evil schemes, random events and FAB cards which give bonuses to the player's. In Thunderbirds, you and your friends take on the role of International Rescue – a secret organization formed to render aid when all other means have failed. Meanwhile, your arch nemesis, The Hood, is threatening to trigger terrible disasters around the world in an effort to learn your secrets. If you can foil his scheme while completing your missions, then you and your fellow players win the game! Add a Review for "Thunderbirds"